Castle Risk is not a more complicated version of the original Risk board game because of the fact that more strategic planning is involved and that there are more pieces and elements to account for before and after battles. 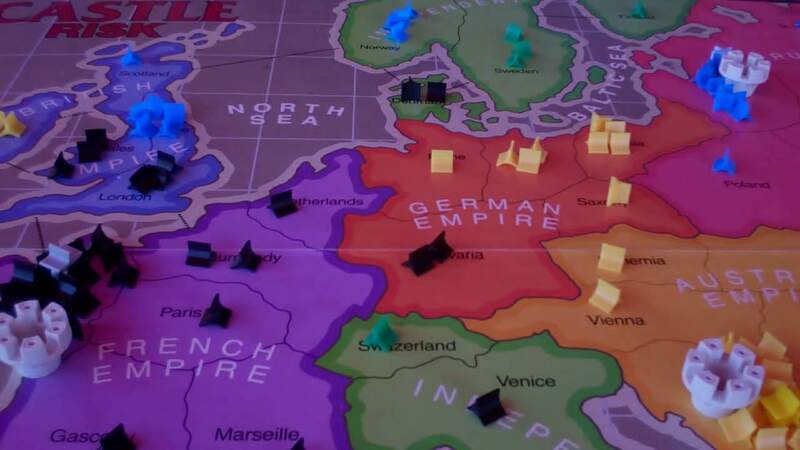 Unlike Risk where all 7 continents of the world make up the board, players are given a new board to commence battle on, a board that specifically highlights the continent of Europe. Another difference would be that you add troops after a battle, and not before a battle. Europe is separated by 6 empires and 3 neutral areas. For each empire a player controls he or she will receive 4 troops per turn. Alternatively, each neutral country can be worth 2 troops per turn. To begin play Castle Risk, each player will start out with a castle, a flag, and 3 cards from the 48-card deck. In a 2-player game of Castle Risk, 20 men will be in each player’s army, but that number will decrease if more than 2 players participate. Turn order is determined by the roll of a single die, from the highest roll to the lowest. Players must first choose a flag, which are turned upside down to prevent cherry picking, to determine what their original country will be. However, no player can choose a neutral country. The flag is placed on top of the castle by the player in the original country. The “state” of the country where the castle resides is designated as the capital. See also Risk Godstorm board game. When picking an empire, each of the 6 empires has their own set of advantages and disadvantages that players will have to be aware of. French Empire: Often viewed as the best empire by experienced players, the French Empire has solid access to Britain and great access to Spain. The 6 territories of this empire are Paris, Gascony, Brittany, Burgundy, Marseille, and the Netherlands. This empire has 5 international harbors, 2 neutral neighbors, and 2 empire neighbors. British Empire: While the British Empire is highly defensible, it is in an isolated position on the board. London, Yorkshire, Wales, Ireland and Scotland make up this empire’s 5 territories. Having 5 international harbors, this empire has only 1 neutral neighbor and 1 empire neighbor. German Empire: The German Empire is a tough empire to play because of the fact that you will be surrounded by an opposing empire no matter where you go. Berlin, Rhine, Saxony, Prussia, and Bavaria are the 5 territories of this empire which has 3 potential harbors, 2 neutral neighbors, and 3 empire neighbors. Austrian Empire: Considering the challenges regarding naval navigation, it will be the most difficult if a player chooses the Austrian Empire. Trieste, Vienna, Bohemia, Galicia, and Hungary are the 5 territories of this empire, which has 1 international harbor, 1 neutral neighbor, and 3 empire neighbors. Ottoman Empire: If a player chooses the Ottoman Empire, that player will have to contend with a special rule known as the Black Sea Rule. The Black Sea is a landlocked body of water, which means that a player can’t launch a naval landing from the Black Sea or Bulgaria. A player can’t suddenly travel to Britain from the Black Sea. What happens on the Black Sea stays on the Black Sea. The 5 territories of the Ottoman Empire are Serbia, Romania, Bulgaria, Greece, Turkey and Montenegro. This empire has 3 international harbors, 3 Black Sea harbors, 1 neutral neighbor, and 2 empire neighbors. Russian Empire: To a lesser degree, the Russian Empire also contends with the Black Sea Rule, but it will also be challenging to travel with this empire. Moscow, St. Petersburg, Livonia, Smolensk, Ukraine, and Poland are the 6 territories of the Russian Empire, which has 2 international harbors, 1 Black Sea harbor, 1 neutral neighbor, and 3 empire neighbors. Neutral Territories: There are 11 neutral territories independent of the 6 empires, which are Switzerland, Venice, Naples and Rome, which make up Italy, Barcelona, Madrid, and Portugal, which make up Spain, and Sweden, Norway, Denmark and Finland, which make up Scandinavia. Army Deployment: Each player places 5 armies in their territories per turn until none remain. It is encouraged for players to be judicious about army placement on borders and coastlines and consider strategic locations for a “Hidden Army”. Hidden Army: Players will write down the name of the territory they wish to deploy reinforcements known as the Hidden Army and will keep their chosen territories concealed. A player’s Hidden Army strength grows with every reinforcement card that is played, and Hidden Armies can only be withdrawn if a player owns that chosen territory. Diplomacy Phase: The cards in the 48-card deck that are playable for the Diplomacy Phase are the Spy, Diplomat, and Reinforcements cards. A player must bring his or her hand up to at least 3 cards to start playing a card. Playing the Reinforcements card means that you are going to commence a battle with an opponent. Playing the Diplomat card means that you will block an opponent from attacking you for 1 round of play. Playing the Spy card allows you to look at an opponent’s hand and assassinate 1 card. However, if an opponent has a Spy card in his or her hand, then a counter-assassination unfolds, taking out both your Spy and your opponent’s Spy. Attack Phase: The playable cards for the Attack Phase are the General, Marshall, and Admiral cards. When playing these cards, you must first declare your attack by choosing a location and announce your card use before you roll the dice. The General adds 1 to your attack number, the Marshall adds 1 to your defense number, and the Admiral allows you to attack from the sea. Protect Your Castle: The goal for every player is to protect his or her castle at all costs. Just like the King’s value in the game of chess, if you lose your castle, you lose the game. When an empire falls, you as the victor will reap the rewards by removing the fallen empire’s castle from the board and post their flag in your castle. You will receive 8 bonus armies for every Spoils Phase, as well as all your opponent’s cards and any unused Hidden Army contracts. Spoils Phase: A player will receive 4 armies for each empire that is fully occupied, 6 armies for all 11 neutral territories that are occupied, and 8 armies for each flag that is in your castle. If you’re more interested you may read these instructions on Hasbro’s website. 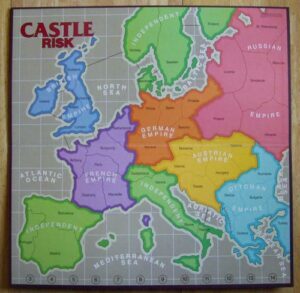 Parker Brothers produced the first edition of Castle Risk in 1986, providing a 19’x19′ board, 1 Admiral’s Ship, castles, flags and mini-triangles and mini-stars that serve as army units. 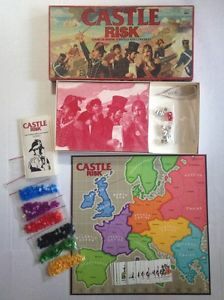 The updated version of Castle Risk was produced in 1990, providing a 19’x29′ board but only cardboard circles that serve as the castles and flags. 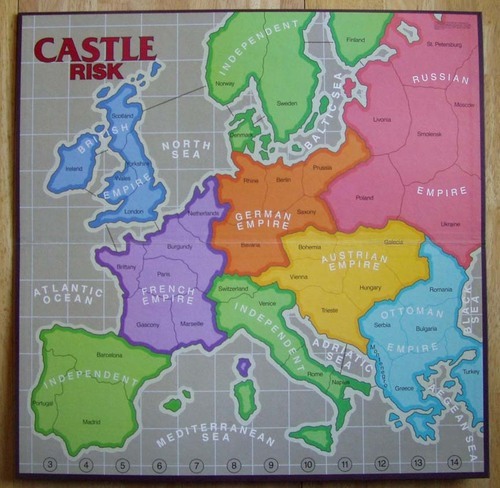 It is recommended that players combine the best components of both versions to get the best Castle Risk experience. To some strategic players, Castle Risk is considered to be a faster paced, more thought-provoking and more enjoyable board game.